Chocolate chips are an essential ingredient in many recipes. Cookies, muffins, pancakes, brownies and even more require chocolate chips. And today, on May 15, we celebrate National Chocolate Chip Day. Chocolate chips were invented by Ruth Graves Wakefield in 1933. She wanted to bake chocolate cookies for her guests, but she ran out of baker's chocolate. She substituted it with cut into small chunks semi-sweet chocolate and added them to dough. Chocolate didn't melt, as she expected, but her cookies had a huge success. Wakefield signed an agreement with Nestlé in 1939 that allowed her recipe of cookies to be printed on the chocolate bar's packaging. For this Wakefield received a lifetime supply of chocolate. The first real chocolate chips appeared in 1941, when Nestlé started selling baker's chocolate in form of chip or morsel. 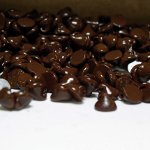 Today you can find any kind of chocolate chips, that would be great for you desserts. Milk chocolate, white chocolate, mint chocolate, semi-sweet, bittersweet, dark chocolate, white and dark swirled, butterscotch chips, peanut butter chips will add your cookies, muffins and bread a divine taste.